Have you ever dreamed of working close to tropical waters where you can have the opportunity to dive, snorkel, swim and spend your free time exploring sun drenched and isolated reefs? The Maldives is well known as a dream destination for honeymooners and holiday makers however we are excited to be working in partnership with a private hospital in the Maldives that is planning to transform the healthcare landscape of this stunning archipelago. Treetop Hospital, is targeted to open in December 2017 and will be a world class tertiary hospital and it’s aim is to improve the health standard of people living in the Maldives. If you think you may be available to commit to a 2 year contract or longer, please do get in touch with me for further details. The hospital follows a 6 day working week pattern. The working day is usually 8 hours per day with 1 hour for lunch but the department is a blank sheet currently so working patterns can change due to how consultants want to run their departments. Translation services are on hand to assist with non-English speaking patients. 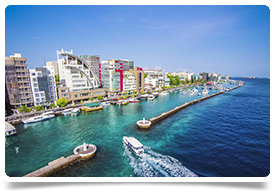 Based very close the capital of the Republic of Maldives (Male) you will be working in a 188-bed multidisciplinary tertiary care hospital in Hulhumale. Located in the Indian Ocean, the Maldives lie southwest of India and Sri Lanka (in the Arabian sea). There are twenty-six atolls which make up one of the world's most geographically dispersed countries. It is also the smallest Asian country by both land area and population, with a little over 393,500 inhabitants but this population can double during peak holiday seasons so you may also treat tourists while working at the hospital. Malé is both a city and an island, combining cosmopolitan style with laid-back islander roots. It has a spectacular skyline with candy coloured buildings and there are turquoise waters that lap onto the many man-made beaches. Male is only 1.7 Kms long and 1 Km wide but is population to around 100,000 people so it is the most densely populated city in the world, although this does make it very easy to get around so you don’t have to worry about a long commute on the tube or bus to work everyday. Malé is also home to a surprising concentration of shops and markets. The local market on the northern side of the island is a great place to catch a glimpse of local life while shopping for inexpensive but fresh fruits and vegetables. Two blocks away is the fish market and there are also an abundance of textile shops on the island. English is widely spoken and the Maldives is a majority Muslim country. PLEASE NOTE THAT APPLICANTS MUST SPEAK AND WRITE ENGLISH AT A FLUENT LEVEL AND HAVE A CLEAN MEDICAL LICENSE. other opportunities contact Amanda today.